Domain cloaking is the process of hiding a web page from one or more visitors. Cloaking is used to hide complex web pages from search engine spiders (and replace the web page with a less complex search engine friendly page) and to protect web page software from unwanted visitors. This figure shows how domain cloaking displays a different web page to search engines than are displayed to visitors. 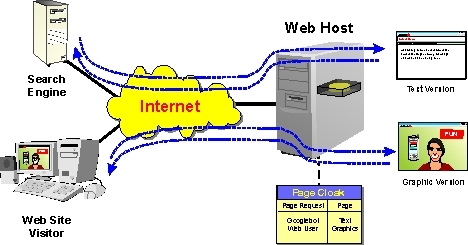 This example shows that when a the web server detects that a search engine spider is requesting a web page (such as the googlebot), it redirects the source of the web page to a search engine friendly web page (lots of text). When a visitor (non-spider) requests a web page, the web server provides a more graphics friendly web page (lots of graphics and animation).